Hospital staff will be joining one of Hull’s biggest parties of the year this weekend, as Hull University Teaching Hospitals NHS Trust shows its pride in more ways than one. Members of HEY Let’s Sing, the Hull University Teaching Hospitals NHS Trust staff choir, will be performing for the second consecutive year at Pride in Hull tomorrow. In 2016, this talented group of staff, which includes radiographers, midwives and therapists, were chosen to perform on the main stage. This year, they have been invited back again to help raise awareness of LGBT+ issues and to join in the celebrations, performing at the Bandstand in Queen’s Gardens at 3 and 4pm. As well as treating revellers to favourites from Fleetwood Mac and Katy Perry, HEY Let’s Sing will also be joining in the Pride in Hull parade. The parade begins at 12 noon from Hull College, when the 30 strong group of health professionals will join the procession on foot, weaving and waving their way through the city’s crowds. “Taking part in Pride last year was such a great feeling; there was a really safe, supportive and celebratory atmosphere and it felt very inclusive too. 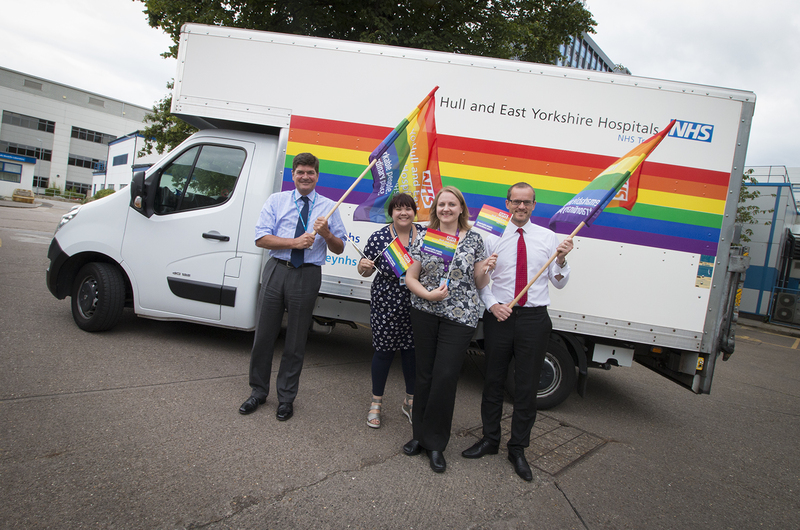 Saturday’s festivities will mark the start of a week full of Pride celebrations, and to ensure Hull University Teaching Hospitals NHS Trust is playing its part in raising awareness, a number of Trust delivery vehicles have been emblazoned with rainbow stripes and a 5ft Pride flag will also fly from the top of the Hull Royal Infirmary tower block next week. “Our Trust is extremely proud of the people who work here and of our city as a whole, so for Hull to be chosen as the focus for the UK’s first ever national Pride event is just brilliant. “As an employer of over 8,000 people, we are fully committed to the principles of equality and diversity. Opportunities like Pride in Hull give us the chance to celebrate our remarkable people, to showcase the city, and to embrace the rich diversity we have here.